The largest in the Carousels of Distinction collection. This fine musical carousel has six individual horses that each go up & down on their brass rods as the canopy revolves to the music. The all mechanical action is spring wound by turning the entire top of the carousel. Meticulously hand painted in traditional carousel colours and decorated with highly detailed scroll carvings, flower reliefs and jewels. 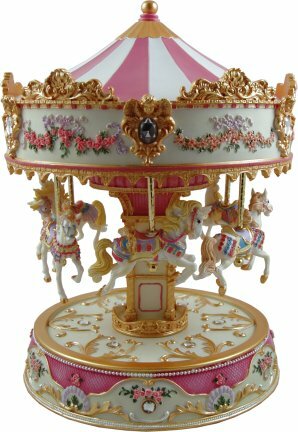 A perfect keepsake heirloom for the carousel connoisseur.